Erika Bent (APM Agricultural Pest Monitoring Cons. Ltd.) has found cranberry fruitworm (Acrobasis vaccinii ) and cherry fruitworm (Grapholitha packardi ) larvae in highbush blueberries over the past week. The larvae feed inside the berry and move from berry to berry. Cherry fruitworm is known to be particularly problematic because infested fruit cannot be adequately sorted out on the processing line or when picking, as there is limited shriveling or softness. If needed, insecticides should be applied this week. 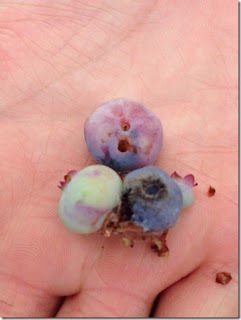 To determine need, scout fields looking for prematurely ripe berries with frass and boreholes (see photo below). Insecticides registered in Canada for fruitworm in blueberries include Rimon (novaluron), Altacor (chloranthraniliprole), Assail (acetamiprid), and Malathion. Malathion will also control Spotted Wing Drosophila (SWD), but Altacor, Rimon, and Assail will not kill SWD. For organic growers, DiPel (Bacillus thuringiensis var. kurstaki) is registered for suppression of fruitworm. Spray at peak trap catch and continue on 3 to 7 day intervals, upto a maximum of 4 applications. Larvae must ingest DiPel to be effective, so it works best when temperatures are warm and larvae are more active. Dipel will reduce damage from cranberry and cherry fruit worm compared to unsprayed plots but the control is usually less than that provided by other insecticides listed for control of these pests.